Monetary policy tightening in advanced markets and a slowdown of China’s economy remain downside risks to this outlook, which could cause some volatility and uncertainty for firms in emerging markets. However, there are some markets that we foresee to be strong performers in 2018 and which are less vulnerable to these global risks. 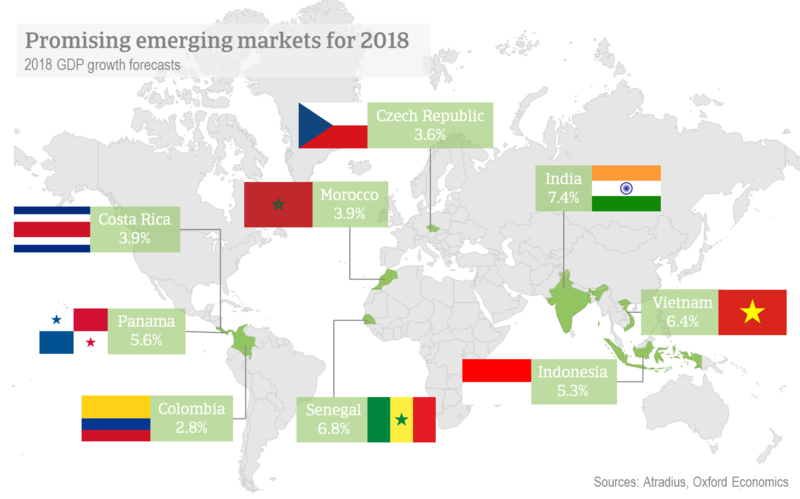 This year’s promising markets include Colombia, Costa Rica, the Czech Republic, India, Indonesia, Morocco, Panama, Senegal, and Vietnam. Stronger global trade, higher commodity prices, still benign external financing conditions and supportive domestic policies in some major markets have strengthened the recovery in emerging market economies (EMEs) in 2017. At the aggregate level, economic growth in EMEs accelerated from 3.6% in 2016 to 4.4% in 2017. The same trends are expected to strengthen growth further to 4.7% in 2018. While the general picture for 2018 is more optimistic, the main downside risks to the 2017 outlook are still present this year. Namely unexpectedly quick US monetary policy tightening and a faster slowdown of the Chinese economy are potential challenges. In identifying promising markets in this environment it is therefore as important as ever to consider economies with strong, domestically-driven economic growth and with the capacity to deal with external shocks. Why are certain markets so promising? Domestically-driven growth – GDP growth fuelled primarily by private consumption and fixed investment as well as sufficient external buffers and a flexible exchange rate reduce the downside risk stemming from global volatility. Supportive policies – Stable political and institutional conditions are important. Opportunities are increasing in several countries where macroeconomic policymaking is improving, especially in Asian economies: India, Indonesia and Vietnam. Agriculture and food – The agriculture and food sectors in Vietnam and Indonesia are expected to grow substantially in 2018, underpinned by large populations and growing middle classes. The food sector in Indonesia is forecast to grow between 7% and 8% this year, and demand for imports, particularly of fruits, dairy, eggs, wheat, soybean and sugar, is expected to remain high. Demand for dairy products is also high in Vietnam where fertiliser use is expected to pick up to support the higher agricultural production. Automotive – With the European Union’s robust economic outlook, the Czech automotive industry – which accounts for more than 7% of GDP and 20% of exports – has a promising outlook in 2018. Sales are robust, payment terms and margins are stable. And insolvencies are low. Morocco, whose automotive sector is also oriented towards EU exports, has strong growth potential in 2018 too. Vietnam is becoming an increasingly important market for automobile sales, including luxury cars, which manifests in higher car imports and higher foreign demand for car parts. With a lack of suppliers with a strong domestic presence, reliance on imports for automobile production is likely to remain high. The removal of tariffs on vehicle imports from ASEAN member states as well as the positive economic outlook is expected to drive growth of passenger vehicle sales in 2018. Chemicals and plastics – The Czech chemicals industry is recording increasing demand with stronger GDP growth. Demand for petrochemical products is increasing, as well as output from the rubber and plastic subsectors, all benefitting from solid demand from the automotive sector. The Indonesian automotive sector is also supporting local demand for chemicals. Improving infrastructure is expected to increase investment in new manufacturing plants in Eastern Indonesia. In Vietnam chemical imports, particularly of raw material inputs and active ingredients, are forecast to enjoy about 10% compound annual growth over the coming decade. Infrastructure – Population growth, urbanisation, and government policy drive opportunities in the infrastructure sector in several economies. In India, a heavy government push for roads, railways, defence, and power is increasing demand in the infrastructure sector. Costa Rica’s infrastructure sector is also enjoying strong growth, buoyed by foreign investment and growth in the tourism sector. In Panama, the government has several large infrastructure projects underway and the outlook is positive, supported by the country’s low-risk project development environment. There are also large opportunities in Senegal with high demand for railway, road, and power supply development. Machines and engineering – The machinery sector of Indonesia is expected to grow between 5% and 7% this year, with government-led infrastructure and electricity development leading to increasing import demand by the construction sector. 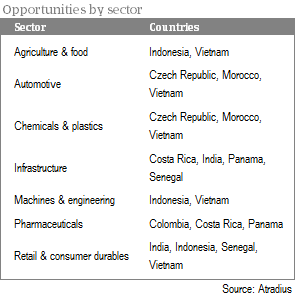 Growing investment in infrastructure development in Vietnam is also driving higher machinery and equipment imports there. Pharmaceuticals – There are many opportunities in the pharmaceuticals sector in Latin America. The business-friendly environment in Costa Rica increasingly attracts multinational investment in the pharmaceutical market, which is the third-largest in Central America. Costa Rica has one of the best healthcare systems in the region and, with a rapidly ageing population, healthcare spending is expected to increase robustly. In Colombia, higher state investment in healthcare services has increased demand for medicines, especially generics. Pharmaceutical sales are expected to expand steadily in line with economic growth there, underpinned by the unprecedented political and security stability. In Panama the market is also expected to grow strongly due to an expansion of the healthcare infrastructure. Additional growth factors are the rising prevalence of chronic diseases, sustained economic growth, and the improved attractiveness the Colón Free Trade Zone as a location for businesses to increase production in, owing to the expansion of the Panama Canal. Retail, consumer durables and electronics – Robust economic growth and low unemployment should drive strong wage growth in Vietnam. Private consumption is expected to grow 6.9% in 2018, offering compelling opportunities for consumer-facing companies. 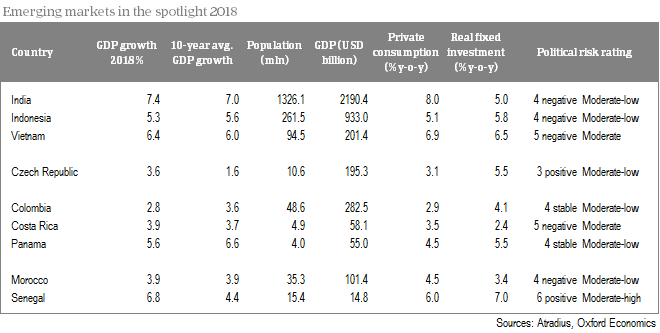 Private consumption is also the key driver of real GDP growth in Senegal, which increases demand for consumer durables. In Indonesia the increasingly affluent middle class is driving demand in the retail and consumer electronics sector, but shifting consumption patterns from brick-and-mortar to online shopping may pose a risk to physical retailers, while providing a huge opportunity in the e-commerce industry, which recorded around 30% growth in 2017. Organised retail in India still has low penetration, but this is expected to pick up in 2018 as the government eases norms on single and multi-brand retail establishments. There is high growth potential as the sector becomes increasingly organised. Reforms have been made to diversify the economy by developing manufacturing and providing a favourable investment environment. But stumbling blocks remain.